Browncoats, take heed! 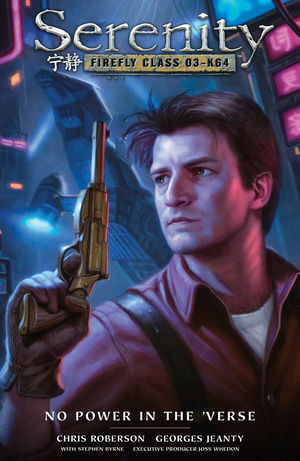 The adventures of Captain Mal and the crew of Serenity continue, and they come in the form of comics from Dark Horse. The latest run, No Power in the ’Verse, hit comic shops between October 2016 and March 2017, and you can now pick up all of its issues in one hardcover collection. Like many in the ’verse, I miss Firefly. I miss Captain Malcolm Reynolds and his trusty crew of freedom fighting misfits, and more than that. I actively mourn them, today, 15 years after I watched episodes as they aired (Friday nights at 7:00 p.m.—thanks for nothin’, Fox decision makers); 14 years after I immediately purchased the DVD set (three unaired episodes! “The Train Job” wasn’t supposed to be the premiere! Thanks again for nothin’, Fox decision makers); and 12 years after I watched the feature-length film follow up, Serenity (in this case, a sincere thanks for your part in this, Fox decision makers). In the case of most shows, once they’re gone, they’re gone. If you’re lucky, you get closure in the form of a well-produced series finale that lets you know what path all of your favorite characters will continue on, after you don’t get to watch them anymore. If you’re unlucky, the show ends suddenly mid-arc, the victim of low ratings—anyone remember Journeyman, the time-travel series from 2007?—or wraps things up in a way that you hate. However, luckily for fans of Joss Whedon’s television series, many Whedon creations have continued their adventures in comic-book form through Dark Horse Comics. 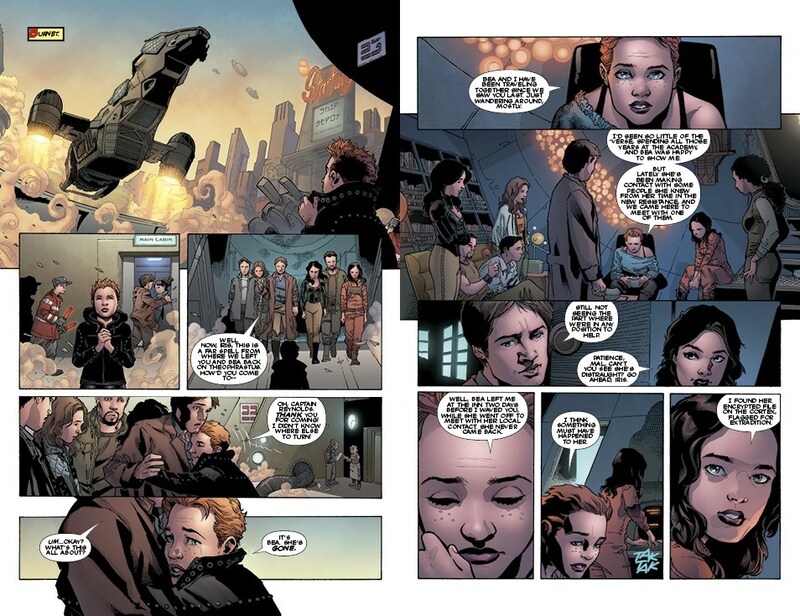 And in my opinion, the most important is the continuation of the captain and crew of the Firefly-class ship Serenity. I don’t make this pronouncement lightly. My fandom is passionate when it comes to all of Joss Whedon’s television work. I’m thrilled that Buffy the Vampire Slayer got a season 8 through Dark Horse, and I think it’s fabulous that Angel (which concluded with an open-ended battle) got to keep telling its story. But Buffy kicked supernatural rear for seven years on the small screen, and Angel had five years of his own to brood around Los Angeles—fans got to see how things played out in those universes. Captain Mal and his crew got 14 episodes and a movie, and we got only the merest glimpse at the wide world that could have been. So for those fans like me who still miss the ’verse that was shown all too briefly in the television series, the comics that are being produced by Dark Horse allow us a viscerally satisfying way to continue that story. The comics aren’t perfect. There are some tired themes that continue to be recycled, such as Simon’s dissatisfaction with life on Serenity (which was already fully explored, in my opinion, in both the television series and the film). But at this point, as a fan, I am immensely grateful to be given an opportunity to continue these adventures with the crew of Serenity. Not every beloved series gets the chance to be resurrected like this. My profound hope is that No Power in the ’Verse will prove to be only the latest of many series in a world that will be granted the long life that its onscreen incarnation was denied.